Nettex Electrolyte Maintenance Liquid can help your horse to recover quicker & maintain their stamina, by replacing vital Potassium, Sodium & Chlorides lost during sweating. Also contains branch chain amino acids (BCAA) to aid muscle recovery. 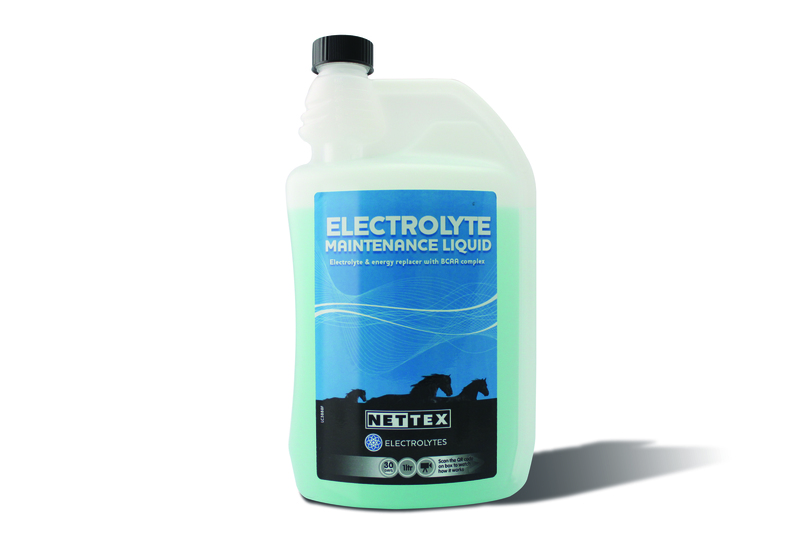 Nettex Electrolyte Maintenance Liquid is ideal for horses who don�t like powders in their feed. It can be fed either mixed in with feed, or given directly into the mouth with a syringe. For horses & ponies that are in hard work, hot weather or competing, give the same amount twice daily rather than just once daily. Vetidral is a high quality electrolyte powder formulated by Audevard. Vetidral Flash is a high quality electrolyte paste that comes in an easy to use syringe & is formulated by Audevard. Nettex Electrolyte Maintenance Powder can help your horse to recover quicker & maintain their stamina, by replacing vital Potassium, Sodium & Chlorides lost during sweating. It can be given mixed in with feed, or diluted in water. Nettex Electrolyte Syringe Paste Boost is easy to give when a quick fix is needed. It helps speed recovery & maintain stamina, by replacing vital Potassium, Sodium & Chlorides lost during sweating. Contains branch chain amino acids to aid muscle recovery. Horse Quencher is a fantastic product, made with an all-natural mixture of grains & flavourings, that once added to a bucket of water, will encourage even the most stubborn horses to drink their water. Ideal for competitions, travelling or illness. Equistro Azodine is an electrolyte powder specifically designed to restore balance to your horse's muscles. It contains calcium, chloride & sodium, to replace the large amounts that are lost in equine sweat. Electrolyte Gold has been scientifically formulated to give your horse the essential electrolytes and vitamins required in a glucose and amino acid base. Electrolyte Gold also benefits from high levels of antioxidant Vitamins E (1000iu) and C (750mg) which helps protect the muscle tissue by eliminating ?free radicals? noxious by products of exercise. Isopro is a scientifically formulated electrolyte supplement designed for daily use in performance horses.